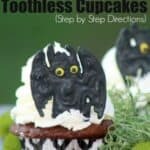 For these Easy Toothless Cupcake you can use this homemade Chocolate cake recipe or you can use this how to make a boxed cake taste like a bakery cake recipe and use a box of chocolate cake mix. For the cupcake frosting you can use this whipped icing recipe or homemade buttercream icing and make it the colors your need to. Plus if you have never used an icing bag to decorate a cupcake you can use this How to Create a Cupcake Icing Swirl how to. You are going to need to make Royal Icing as well so you can create your Toothless cupcake topper, use this Cupcake Decorating Royal Icing Recipe to make that. Make your cupcakes according to the recipe and let them cool. Make your royal icing according to the recipe and set aside. Locate a picture of the “Toothless” on Google…(this is a good one to use) print the picture in color. You want the color so you know where to put what when making these Easy Toothless Cupcake. Make a few copies and scale it down to the size you need. then Tape the pictures on it to a cookie sheet. Tape wax paper (covering the copies of the image) to the cookie sheet . 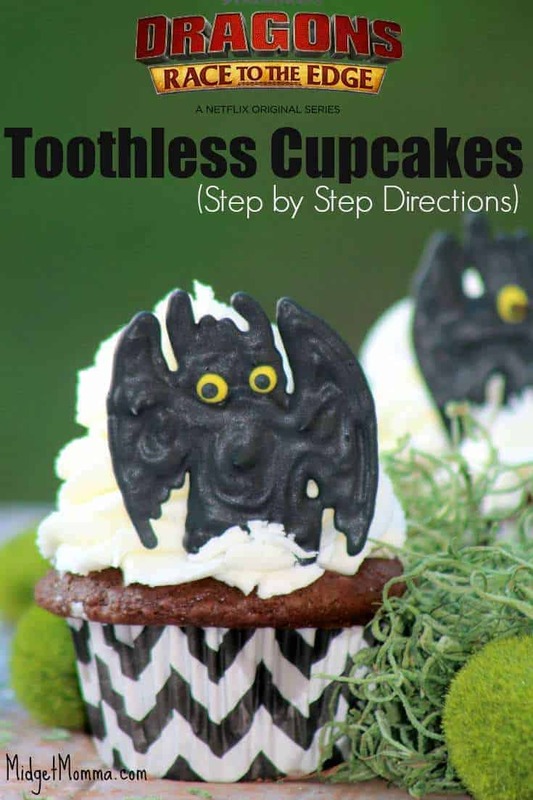 Follow the color and features as printed on the paper when making these Easy Toothless Cupcakes. Take your royal icing and remove 2 teaspoons from it and dye it green. Dye the rest of the royal icing for your Easy Toothless Cupcakes black. Using a small pastry bag fill with the black royal icing and a #2 tip. 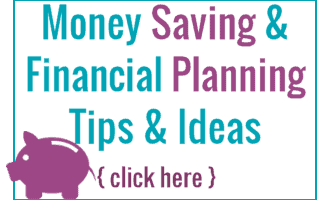 Start by outlining “Toothless” first….allow to slightly dry. Fill in the image with the black icing (except where the picture shows another color)… allow this to dry for 30 minutes. With the neon green make two dots for the outer eyes. Allow them to dry before adding a smaller black dot for the eye balls. Ensure that the image is dry, gently touch one of them with your finger if it allows you to push in on the icing allow it to dry more…. If the image is dry then it will have a hard feeling not allowing you to push in on it. This is what you want so they are stable on your Easy Toothless Cupcake. Cut the wax paper holding the completed image into squares surrounding the completed design. Get your cupcakes and pipe your frosting on them. Then add your Toothless on the top of your cupcake. Locate a picture of the "Toothless" on Google...(this is a good one to use) print the picture in color. You want the color so you know where to put what when making these Easy Toothless Cupcake. Make a few copies and scale it down to the size you need. then Tape the pictures on it to a cookie sheet. Using a small pastry bag fill with the black royal icing and a #2 tip. Start by outlining "Toothless" first....allow to slightly dry. Fill in the image with the black icing (except where the picture shows another color)... allow this to dry for 30 minutes. Ensure that the image is dry, gently touch one of them with your finger if it allows you to push in on the icing allow it to dry more.... If the image is dry then it will have a hard feeling not allowing you to push in on it. This is what you want so they are stable on your Easy Toothless Cupcake. Now these are plain adorable! I know my niece and nephews would love these!!!! Might have to make these for them! My kids are crazy for Toothless! 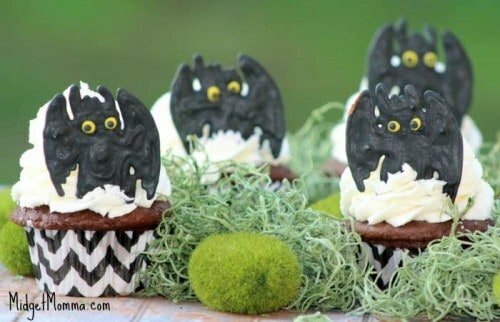 These are adorable cupcakes and would make for a great treat while getting your Netflix fix. This would be a great idea for Halloween! Planning a Halloween block party and gathering ideas now. Thanks for sharing this recipe! How adorable! What a fun idea and the movie is super cute. Those are super cute! My kids love this series and watching it all the time.